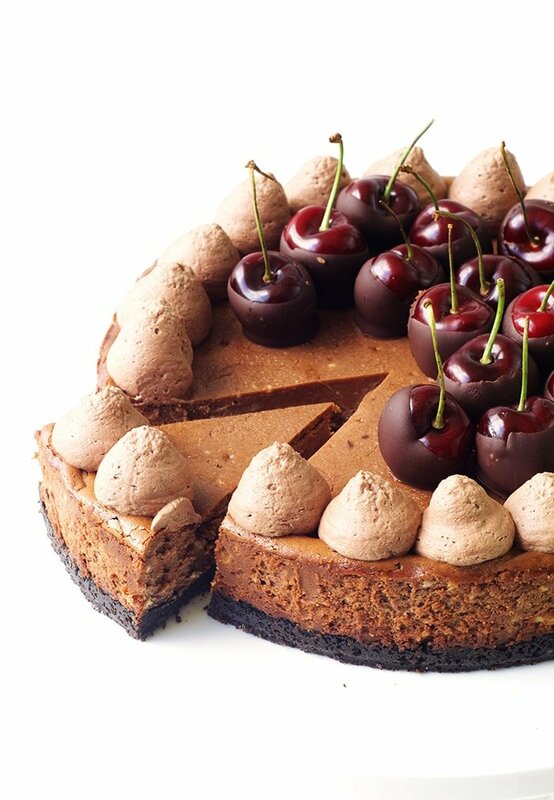 A gorgeous baked Black Forest Cheesecake complete with an Oreo crust, chocolate-dipped cherries and swirls of chocolate cream. Cons: It’s hard to stop at one piece! Hi friends! It’s Jess here from Sweetest Menu and I have a special dessert to share with you today. 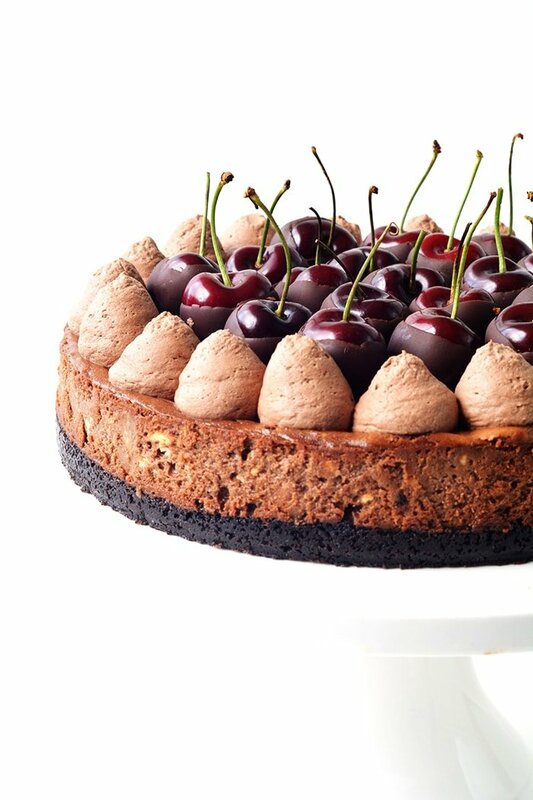 This Black Forest Cheesecake is beyond delicious and the perfect addition to your Christmas table. 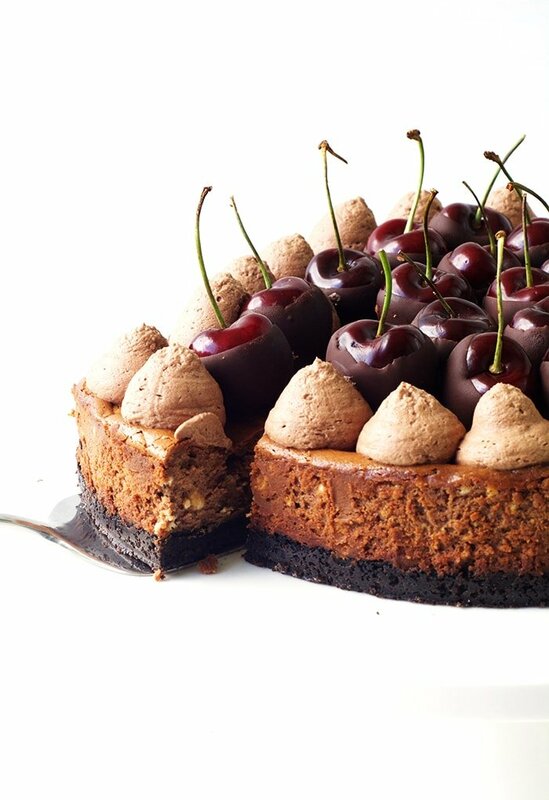 Creamy baked chocolate cheesecake featuring an Oreo crust, topped with chocolate dipped cherries and clouds of chocolate cream. What a showstopper am I right? And you’ll be glad to know it’s much easier than you’d think! If you have been concerned about making baked cheesecakes in the past, you need to try this recipe. It’s really simple and you don’t even need a water bath! 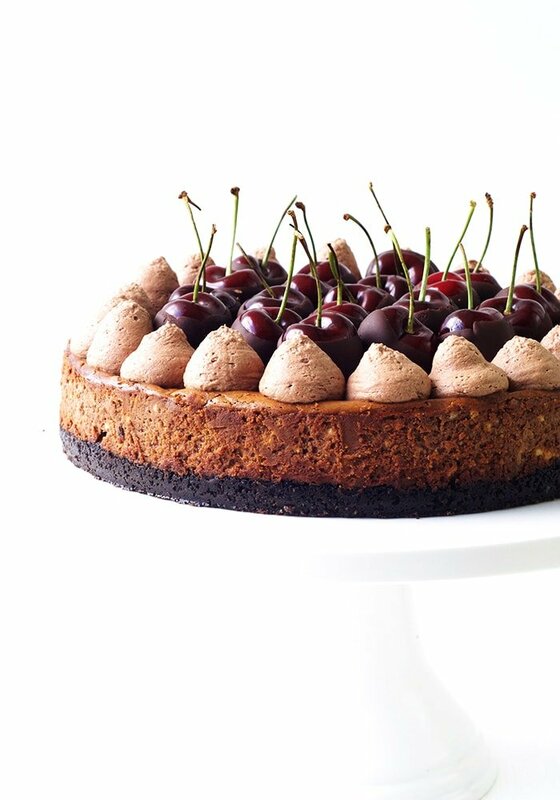 You’ll end up with a deliciously rich cheesecake that will be the hit of the party. I have a few tips for creating the perfect cheesecake that I have learnt along the way. 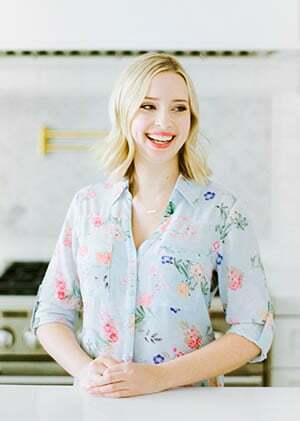 These include always making sure your ingredients are at room temperature – this includes the cream cheese, eggs and sour cream in this recipe. Make sure you beat your cream cheese well to avoid any lumps in your final batter. To help avoid cracks in your cheesecake, you don’t want to over mix your batter but when you are first beating the cream cheese only, go for gold and get it very smooth before adding the extra ingredients. Preheat your oven to 320 F (160 C). Lightly grease a 9 inch (23 cm) springform baking tin with a little butter and set aside. Add your Oreo biscuits (cream and all) to a food processor and blend until they resemble fine crumbs. Melt your butter in the microwave and then pour over your crushed Oreos and whiz again until the mixture resembles wet sand. Pour your Oreo crumbs into your prepared tin and press down gently using the back of a spoon to form an even layer. Pop in the fridge. Add your cream cheese to a large mixing bowl and beat well until smooth and creamy. Add your sugar and beat again. Melt your chocolate in the microwave and set aside to cool slightly. Then add your eggs to your cream cheese mixture, one at a time, until incorporated. Add vanilla extract and gently beat. Then stir in your sour cream and your melted chocolate. Stir until smooth but try not to over mix. Pour your cheesecake filling over your crust and smooth over the top. Bake in the oven for approximately 40-45 minutes or until it no longer wobbles in the middle. Try not to over bake it as it will continue to cook as it cools. Leave the cheesecake in the oven with the door ajar for at least one hour. Then remove and leave to cool slightly on a cooling rack before transferring to the fridge. The cheesecake is best left in the fridge for 3-4 hours (or overnight) until it cools completely and becomes nice and firm before slicing. To decorate, melt your chocolate in the microwave, stirring in-between 15 second bursts. Place a sheet of baking or parchment paper on a plate. Then dip your cherries using the stem and place them onto your prepared plate. Once you have done all the cherries, pop them into the fridge for at least 15 minutes to set. To make your chocolate cream, beat your cream until whipped, sift in the cocoa powder and sugar and stir until smooth. Add your chocolate cream to a piping bag with a large round tip and pipe clouds of cream around the edge of your cheesecake. Place the chocolate-dipped cherries in the middle. Enjoy! I’m in. Thank you and have a Very Happy Holidays ! Awe!!!! 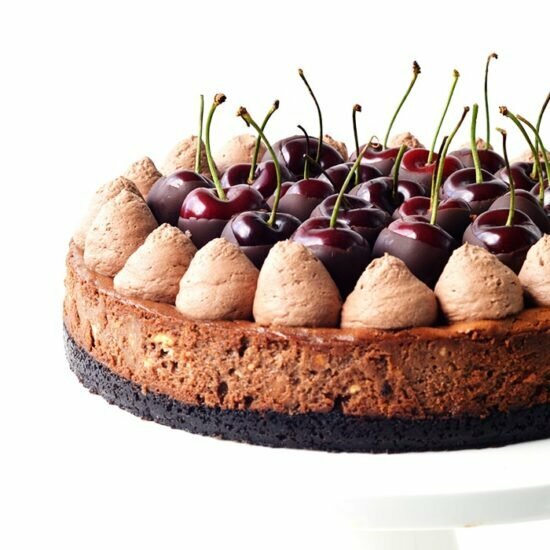 Black forest is one of my favorites 😀 This is really tempting me..
do we need to make a water bath once we put the cheesecake in the oven? This cake looks so amazing. I just can’t wait to make this cake. Thanks for the recipe.